Are you familiar with the Martha Stewart Living line? I was blown away when I saw she had an entire ISLE at Michael’s. 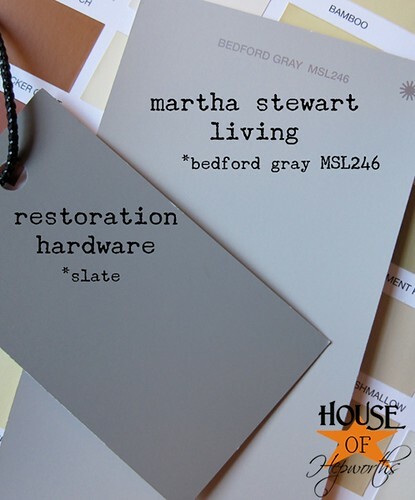 Well, as I mentioned yesterday, I have chosen the Martha Stewart Living paint color Bedford Gray for my family room. There’s a reason I finally decided on this particular color in this particular brand. It wasn’t solely because it looked the best with Restoration Hardware’s Slate paint color. First off, she has *only* 280 colors to choose from. This may sound like a lot, but when you are comparing to other paint brands, this is actually not that big of a selection. Some may think *only* 280 colors is too limiting, but for me, this is perfect. I get overwhelmed with too many choices, especially colors that are all almost the same shade. If I have too many choices I’ll freeze and can’t make any additional choices. I’m this way about clothes shopping and ordering food off a menu. 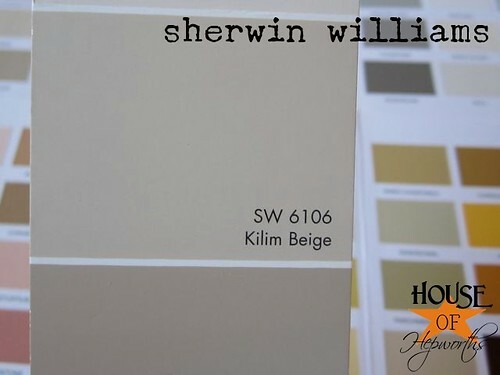 In fact, the only color I’ve painted the last two previous houses I’ve owned is Kilim Beige by Sherwin Williams. I spent months narrowing down my choices to this one color, and had such a tough time making up my mind that once I finally selected Kilim Beige, I just used it for every.single.room. in both homes. 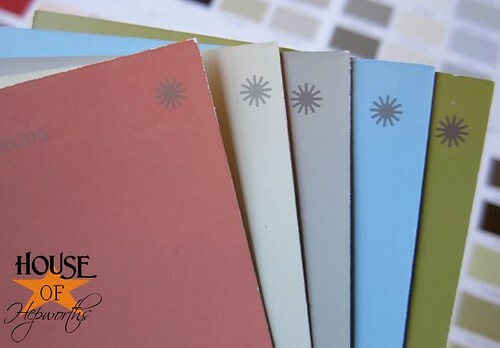 I went there last week to pick up the paint samples for my family room and it was literally love at first sight. Not only does she give you the perfect amount of colors to choose from, she then takes it a step further and organizes them into 6 groups. Did you catch that last part? Her paint colors are organized by symbol and each symbol’s colors work well together or coordinate with each other. Bedford Gray is in the astrict (*) group, so I just gathered up every big chip card with an astrict on it. I know that every single card with a * on it looks good with all the other * cards. Now I can sleep peacefully at night knowing my colors don’t clash. The back of each color chip suggests a ceiling and a trim color that coordinates with your wall color. I can’t make this stuff up, yo! Between the pre-selected perfect 280 colors, the Color Key Symbols, and the coordinating ceiling and trim colors, I’m sold. 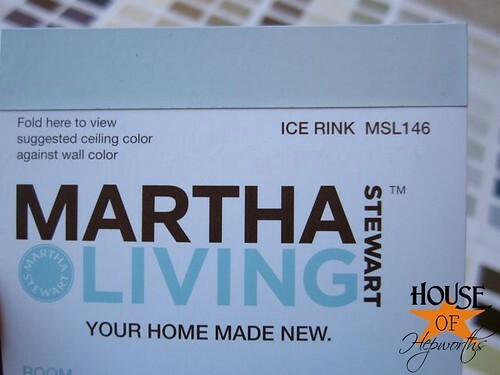 Have you tried Martha Stewart Living products – paint, glitter, craft supplies, drapes, etc? Do you love them as much as I do? Martha should totally hire me to be their spokesperson. Her product line is officially my new favorite. 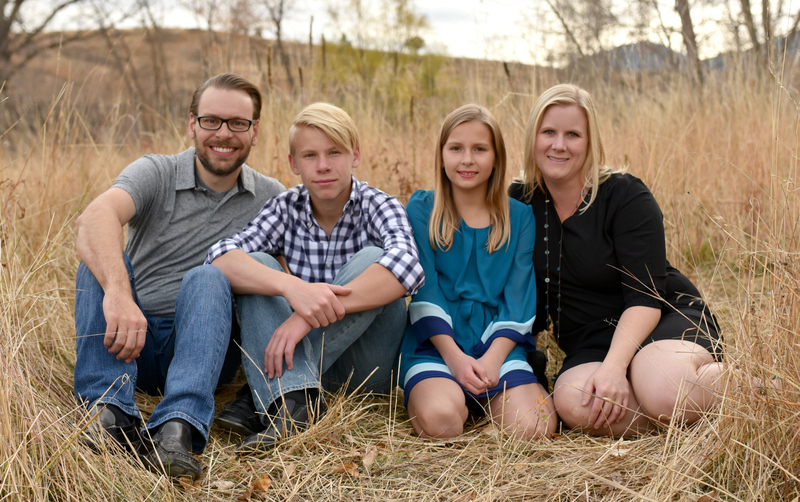 Except for Smiling. “Smilings my favorite!” (Make work your favorite.) (Name that movie!!) Oh, and her teal logo is cute too boot. « Pardon me, do you have any gray pu-paint? I love when things are made easy 🙂 The color you picked is beautiful, I used Martha in my living and dining room, very happy with her colors! Elf! Elf is my favorite! 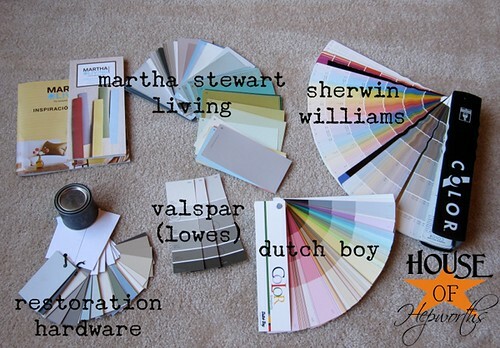 i’ma big fan of the martha stewart paint line too!! i painted our bathroom sharkey grey.. and sophia’s room one of the light pinks. oh andddd the dinging room is from her as well. 🙂 it went up great. and the paint card is actually one of sophia’s favorite toys haha. she points to each one and goes do you like this one? do you like this one?…she’s seen me do that one too many times with my hubby. hehe. have fun painting! can’t wait to see the finished product! ELF of course! Can’t wait to see the finished room! Love Love Love Martha Stewart’s paint line…I too have the problem of freezing up when given too many color to choose from and then I’m left with color sample chips covering my walls because I can’t decide. So far I’ve painted my kitchen, bedroom and bath and am entirely happy with the results….on to the living and dining rooms.. I am gonna have to try her paint! 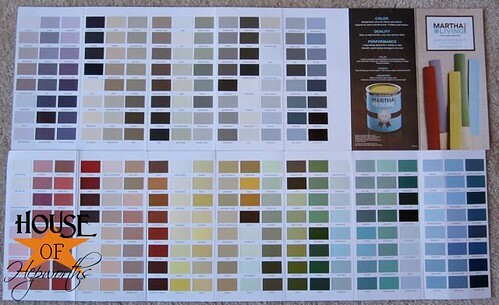 I have just a s hard a time picking paint as you do! I, too, get overwhelmed by all the choices, so this sounds perfect for me too! Thanks for sharing!! God bless! I’m with you on the colors. I’m doing a light gray from Martha Stewart in our bedroom and several of the other colors in the family room. The selection is wonderful. In my opinion, there’s no reason to buy ANYTHING other than Martha, whether it’s paint, craft supplies, sheets, etc. Nothing compares. 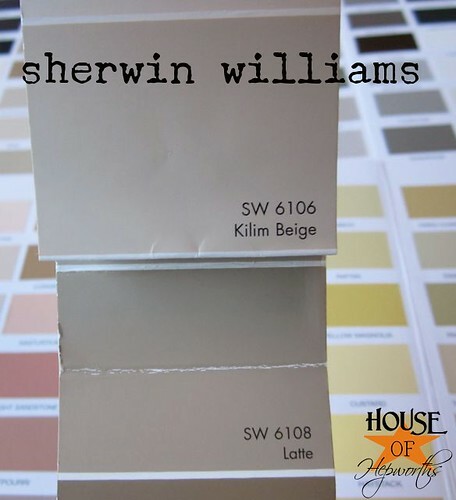 Thanks for spotlighting her paint… I haven’t tried it yet, but my laundry room (okay, laundry closet) needs a makeover and I’m thinking that will be the perfect opportunity to give it a go. Keep your eyes peeled on the Home Depot facebook page (I think). 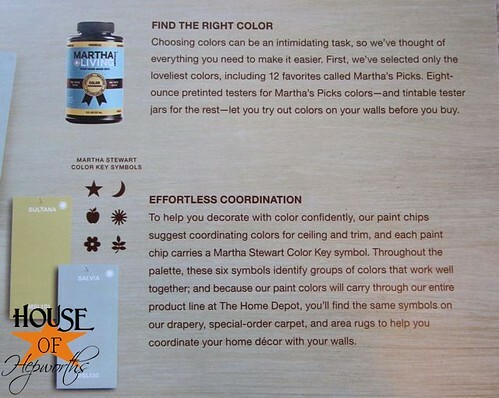 There were at least a couple of times during the holiday season where they were doing a promo where you could get a set of 12 samples of martha’s favorite paint colors for $4, including shipping. A friend of mine got a set and uses them for crafting all the time. Martha Stewart’s Bee Balm Red, from K-Mart, has been on my kitchen and dining room walls for more than ten years and still looks fantastic. Her K-Mart line has, I think, been discontinued. I’m really not sure has I’ve not been in K-Mart in years -smile-. It’s spelled AISLE. And yes, love her stuff at Michaels! 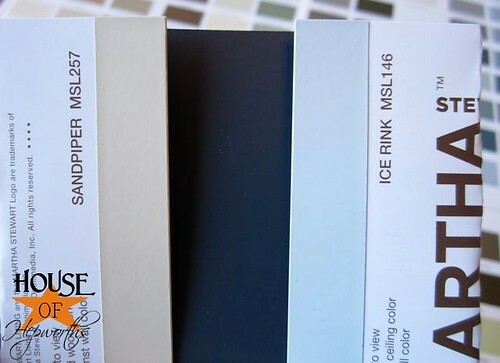 I’m feeling you on the paint picking…I’ve got 12 strips of gray in my guest room. Painful! And Dutch Boy has been waiting on me for MONTHS to choose the paint to review!!!???!!!! What are your faves in their deck? I had to catch my breath when you told us about the symbol coordination system. I knew about the ceiling and trim tips, but not how the paint chips coordinate. It makes me want to run to my local HD just to check it out. Who knew?! 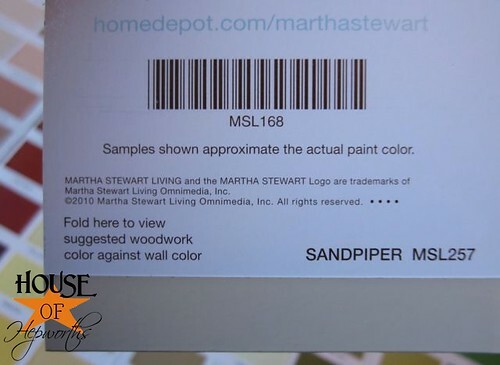 I never knew this about Martha’s paint colors. It’s genius. Thanks for sharing it Allison. I used a tester of Martha Stewart paint on a wood filing cabinet. It went on well and I loved that it barely smelled. Let’s hear it for low VOC paint NOT stinking up the house – woot! I am lovin’ the color you chose!! It is perfect and will go well with the Slate color! I didn’t realize Martha had gone so far into decorating, ie. paint and such. And that they coordinate all across the board is terrific!! I will have to check this out for sure. Elf of course! Can’t wait to see the walls! Her paint is fabulous!! Our living and dining area is MS Fledgling. I looooove it!!! Her coordinated coloring system is wonderful. I was feeling particularly proud of myself when I picked a color to coordinate with Fledgling and it was one of her pre-picked colors and I hadn’t realized “she” had it pre-coordinated. Yep, Martha and I, we think alike. Haha! Can’t wait to see your new walls! I ran to Home Depot and grabbed a sample card in every color as soon as I saw your post! I’ve been trying to choose a paint color for my open floor plan for almost four months. This is exactly what I need; fewer choices…pre-coordinated…LOVE! Now, if I could only figure out what the symbols mean. I’ve searched high and low and can’t seem to find out if they’re grouped according to undertone, palette (neutral, bold, muted), or nothing at all. I know I’m overanalyzing and it probably doesn’t matter but…it’s bugging me. For example, MSL208 (apple symbol) lists MSL256 (asterisk symbol) for the ceiling and MSL057 (asterisk symbol) for the trim. What the heck?!? Thanks for your post and giving me new hope of painting SOON! WOW! Love your blog. I stumbled upon this as I am looking for a great paint color for my master bathroom that is attached to my Restoration Hardware SLATE color bedroom. (I LOVE that color!). Anyhoo.. gonna try Bedford Gray since you love how they look together. Thanks!!! The MarthaStewart Living paint palette shows the symbols; apple, quarter moon, star, etc and says to “look for its Color Key symbol, then match symbols to create a harmonious color scheme from room to room.” I hope this helps. I am looking for the perfect icy blue paint; not too white and not too blue. Any suggestions? Wow! You are amazing! Im a newbie diy-er.., well, sort of… Around about a year, give or take. Ive always been self reliant, but I never realized just how capable a person I was until I started diy-ing. From painting, to homemade decorations (that look quite expensive), to home repairs.. im having a blast and my home actually looks like a home! And martha stewart is awesome.. i used her blue lagoon in my kitchen.. and now im on to repairing our bathroom floor on the 2nd story (bad shower leak). If you have any tips for that id love to hear them! I just hope all of diy-ing hasnt caused a false sense of my capabilities and im not in over my head! Thanks for sharing all of your ideas and hardwork.. it might just be the thing that helps me finish this bathroom! You can do it! Just take it one step at a time. Hi! My husband and I are buying our first family home with our 1 year old son, and I am just getting into the Martha Stewart universe and I don’t think I will ever look back! Though, I too am just finding out that her paint “colors” and coordination palettes are no longer at Home Depot (I know, it happened so long ago). Do you know how I can get a hold of her paint fan deck or a way to see her coordinating colors? I am so in love with her colors and am borderline desperate to find anything to help me paint our new home.